We are in the midst of Holy Week – a week that causes us to run the gamut of emotions – from deep, dark sadness, to extraordinary joy. Tomorrow, Maundy Thursday, from 10-2 and 4-7:30, our church Labyrinth will be available in the Fellowship Hall. As a part of the traditional, quiet walk of a Labyrinth experience, you will also be able to walk the Stations of the Cross, enabling you to move with Jesus on his way to the cross. Ann Weems speaks of these days in her poem No Dances. There are no dances for dark days. There is no music to bellow the pain. And then on Sunday, we will find ourselves filled with the joy of the resurrection. “He is not here. He is risen.” Outside, at 7:00 am, we will greet the sunrise as we remember the women who found the tomb empty that first Easter morning. Following an Easter breakfast, we will return to Easter worship at 11:00. I hope you can be a part of all these offerings, this Holy Weekend. There are so many exciting things going on at Union these days. Preparations for our upcoming mission trip are in high gear as we have already had one very successful fundraiser, and are anticipating another one this Saturday at a church-wide yard sale. The building is alive with voices - those bringing items for sale and others pricing those very same items. We have had our usual Soup and Bible study sessions these past few Lenten Wednesdays. Our annual Easter Egg hunt is coming the day before Easter, Saturday, April 20, at 4:00. There are so many good things happening! And now, we are about to enter Holy Week and our call is to move away from the busyness, to slow down, and be present for what God would have for us. There are several ways to do this. (1) If you have been reading through The List, Holy Week is the final week of reading, as we end with the glorious promise of Revelation 21 and 22 on Easter Sunday. My prayer is that you will continue to hear God’s voice speaking to you through the readings. (2) Perhaps you have moved through the season of Lent using the paper chain, filled with activities and readings for each day. My prayer is that this tool has guided you toward a more intentional Lenten season. (3) Finally, on Maundy Thursday, April 18, we will offer a new way to hear God’s voice, through an opportunity to walk a Prayer Labyrinth set up in our Fellowship Hall. You can read more about it in our April newsletter, http://www.unionchristianchurch.net/ministry-blog/2019/3/29/april-1 Here you will find an extended explanation of what to expect. God has often spoken to me in new and sometimes unfamiliar settings. My prayer is that you will experience God’s voice in a new way on Maundy Thursday as you walk the Labyrinth. For my article this month, I would like to share with you a new experience that will be offered on Maundy Thursday, April 18. Over the past five years at Union, we have shared Maundy Thursday together in several different ways – a more traditional Tenebrae Service of darkness and a Living Last Supper presentation. What exactly is Maundy Thursday? Maundy Thursday is sometimes known as Holy Thursday and is the night when Jesus washed the feet of his disciples and shared the Last Supper with them. It is a solemn day; a day to remember the great sacrifice that is to come. This year you will have the opportunity to walk a labyrinth on Maundy Thursday. For many, this is a word you have never heard, or if you’ve heard of it, you are not sure what it is. Here is a “dictionary” definition: A labyrinth is an ancient symbol that relates to wholeness and is designed for spiritual development and inner growth. It combines the imagery of the circle and the spiral into a meandering but purposeful path. The Labyrinth represents a journey to our own center and back again out into the world. Labyrinths have long been used as meditation and prayer tools. To the left, you can see what one looks like. The Union Labyrinth will be laid out on the floor of the Fellowship Hall and will be available for you to walk anytime from 10-2 and from 4-7:30 on Thursday, April 18. With these expanded hours, we hope that many will take the opportunity to use it. I would like to encourage you to invite your friends, co-workers, and neighbors to join you in this new experience. A labyrinth walk is a slow walk, something that is difficult in our fast-paced world. Our labyrinth will be guided by the Stations of the Cross. From early Christianity, when pilgrims came to Jerusalem, they visited sites where Jesus was known to have been. Eventually, following in the footsteps of the Lord, along the way of the cross, these 14 “stations” became a part of the pilgrimage visit and were incorporated in many church buildings. As you walk the labyrinth, you will have the opportunity to stop at each of the 14 “sites” to read the accompanying scripture and pray, remembering that part of Jesus’ journey. The 14th station marks Jesus being placed in the tomb. *The Stations of the Cross version we will use was developed by The Church of the Nativity, Indianapolis, 2004. It is used with permission. Called by God and led by the Holy Spirit, Union Christian Church is a caring community that learns and shares the stories of faith, serves within and beyond our walls, and welcomes all to gather at Christ’s Table. This Sunday – the fourth Sunday of Lent – we will continue walking with Jesus as he moves closer and closer to Jerusalem. As I’ve mentioned each week, as Jesus walks, he talks and teaches, and this week is no different. We will find ourselves in Luke 15. This chapter contains three different parables about being lost. With an introduction in verses 1-3, Jesus quickly moves to share the story of the lost sheep in verses 4-7, the story of the lost coin in verses 8-10, and finally, the story of the lost son in verses 11-32. We will focus on the last parable, the one most known as the story of the Prodigal Son. But what if our focus has been wrong all these years? What if this parable is not about the lost younger son, or the lost older son, but instead, about the gracious father? I hope to see you in worship on Sunday, and….a little homework. Read all of Luke 15 this week and we will talk about it. Thank you – seems to be not nearly enough for all you have done for me during the decline and death of my mother last week. You have prayed, sent cards, flowers, texts, phone calls, and the list could go on and on. You have supported me the many times I have choked up in the pulpit, holding me up with your prayers. The picture to the right shows the beautiful spray you sent to mama’s funeral. 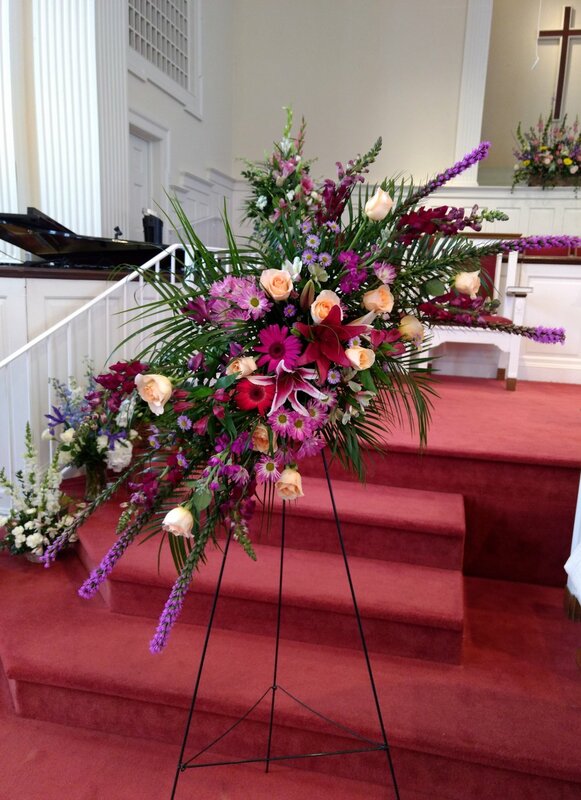 We placed it in the front of the sanctuary for the service. The gardenia from this past Sunday was especially poignant, given that was her favorite flower. Thank you – seems to be not nearly enough for all those who made this past Sunday’s Silent Auction such a success. I was away during much of the preparations and you all just stepped right in and made it work. We are still counting money but are quickly approaching $6000. Thank you for helping publicize, obtaining donations, decorating, setting up, cooking, and bidding. It was a fun night and couldn’t have happened without everyone pitching in. Thank you – for understanding about cancelling our first Lenten Soup and Bible study session last Wednesday. We will begin our shortened study tonight, beginning at 5:45 with a soup supper. Then we will move into a new study by Adam Hamilton about Simon Peter. We will learn from scripture and from video that tells the story of the places Peter lived and ministered. I hope you can join us! You know, I am not unique in these experiences that have shaped my life these past few weeks. Every person at Union has been a recipient of the love and ministry of this church family at one time or another! Thanks be to God!! This Sunday will be a full and exciting day at Union. We begin the day with Bible study and worship, where our focus will be on an unusual passage of scripture. In Luke 13:31-35, Jesus speaks using images that are confusing at best, addressing obstacles that have made their way into his life and ministry. His thoughts can speak to us when we find ourselves blocked by our own obstacles. I hope to see you as we explore this passage together. On Sunday night, the Puerto Rico Mission Team will host a Spaghetti Supper and Live Auction to help raise money for their upcoming mission trip in June. Look carefully at your March newsletter to see some of the items that will be offered. This auction is only as good as those who are in attendance, so please invite your friends and neighbors to join us. It is going to be a good day – filled with Bible study, worship, and fellowship. I hope to share it with you. My heart is overwhelmed this morning as I remember your kind words and prayers at the end of the service on Sunday. You truly blessed me, and I have taken your words with me as I’ve come to North Carolina. Even during these hard days, you remain in my prayers. This Sunday, we leave our study of The List, and begin our move toward the cross during this season of Lent. During these six weeks we will focus our time in the book of Luke, learning from Jesus, as he teaches his disciples. We will begin in Luke 4 this week, as we take a new look at the story of Jesus’ temptation in the desert. Remember to set your clocks ahead and join us for Bible study and worship this Sunday! This Sunday, we come to the final sermon from The List series. Of the eight passages you selected, two had the topic of Love as the primary focus. This week will be second of the two. I am not surprised that a church family as full of love as Union would focus their requests this way! You demonstrate it every day in the way you live and the way you minister to each other and to our community. This week: 1 John 4:7-21. Let these days be days, when instead of “giving up,” you add simple practices that can draw you closer to God. This Sunday, you will find a large basket filled with purple and white paper chains – much like the kind you might have made as a child. These chains are available for you to use during the 40 days of Lent, beginning on Ash Wednesday. Each day, as you remove a link, you will find a simple act to help you intentionally focus on God and what God might be saying to you during this Lenten season. I pray that your days will be filled with quiet listening, time for reading the scripture, and time for prayer as we listen intently and intentionally for God’s voice. This Sunday you will be blessed by the ministry of Ray Austin. Ray is the retired Senior Minister of First Christian, Athens, and is a frequent visitor in our worship services along with his wife, Carol. Please welcome them warmly this Sunday, as I am away. I will be traveling with our youth to the annual Georgia Disciples Youth Assembly at Epworth-by-the Sea. This has long been a tradition at Union and it will be exciting to introduce it to a new group of Union youth this year. Please pray for safety as we travel on Friday and Sunday, and for God to speak to all of us during our time there. First, invite your friends and neighbors to come and join us. We need people to purchase the wonderful items that have been donated. There will be free tickets to hand out to your friends when you invite them to come. You will also find an “event” on the church Facebook page. Please share it on your personal page if you use Facebook. In the coming weeks there will be newspaper ads and a paid Facebook ad. Please be looking for them. Second, if you have an item or service that you would be willing to donate, please let us know. We are already praying for God to work in us during this trip. Will you join us in prayer? On Monday and Tuesday of this week, I had the opportunity to return to my seminary in Atlanta for a series of preaching lectures with Barbara Brown Taylor as the keynote speaker. It was a wonderful few days of seeing old friends and professors, much like a college reunion, as well as a great time of learning. Barbara Brown Taylor is one of the leading voices in preaching and it was a joy to learn from her. Of the many take-aways from her lectures, the one that spoke strongest to me was her emphasis on the importance of words. She spoke brilliantly about the power of words to help draw people into an encounter with God. As we gather together each Sunday, my prayer is that the words I speak and the words we speak together will help all of us meet God face to face, and that this encounter will be life changing. Do you ever ask yourself these same questions? Where is love? What should love look like? Where does it come from? This Sunday we will go digging for answers to these questions as we continue with the next passage from The List - 1 Corinthians 13. These verses are most often known for their use at wedding ceremonies, but could they have a meaning that goes beyond romantic love? I think so! Let’s talk about it this Sunday. The Puerto Rico Mission Team from Union, 18 strong, held its first planning meeting on Sunday, January 13. As we move closer to our trip dates – June 1-7, I would like to share updated information with you, so that you can begin praying for us. Our group is comprised of both men and women, that range in age from high school to senior adults. It is a good team – filled with people with strong skills who want to use their skills to share the love of God with the people of Puerto Rico. We are working with an amazing mission sending agency called Praying Pelican Missions, where we have a consultant dedicated specifically to our group. While there, we will partner with a local church and its pastor. One of the unique things that Praying Pelican does, is allow the mission group to define what type of work they would like to do based on their gifts and interests. As we met, we identified the top three areas this particular team would like to focus on. They are construction – continuing hurricane relief for both homes and churches, working with children – either Backyard Bible Clubs, sports camps, or tutoring, and community health. Would you begin praying with us that God would open the doors to exactly where we should be serving, and to the people to whom we will be ministering? A trip like this obviously costs money. Our plan is to fund the trip with personal pay, a grant from the Church Permanent Fund, and a series of fund raisers. We have two that are already scheduled. First, a spaghetti supper and silent auction on Sunday night, March 17. How can you help with this one? If you have an item that you would like to donate to the auction, please let Holley Downs know. These can range from gift baskets, to crafts, to tickets to sporting events, to nights in a vacation home, to personal services – the list is endless. And – invite your friends and neighbors to join us that night. Information about tickets will be coming soon. For the second event, we plan to have a giant yard sale on Saturday, April 13. How can you help? Begin looking around your home, setting aside things you would be willing to donate. If you can keep them at your home until early April, that would be best for us. Finally – the most important – begin praying earnestly for this trip. We covet your prayers for all that are going, for the people we will be ministering to, but most importantly, that God will be present in everything we do. What is a church? When I was a little girl, I often did the “finger play” rhyme that described a church in simple terms so that even a child could understand. With hands clasped, fingers on the inside, we would recite the words: “Here is the church. Here is the steeple. Open the doors and see all the people.” And as we opened our hands, we would wiggle our fingers, showing all the people. What is a church? This is the question we will explore this week in worship. Is it, like the children’s rhyme says, the steeple, the doors, or the people? Or, is there something more? Our text this Sunday, selected by you, is Acts 2:1-47, from The List: 100 Essential Scripture Passages. While we will focus on verses 42-47 for the sermon, I encourage you to read the entire chapter and ask yourself the questions: What was it that brought this first church together? What were the important elements of this first Christian community? My prayer is that the answer to these questions will prod us forward, to be the best community of believers possible. This Saturday is our annual Chicken Brunswick Stew and many of you have signed up to help with production and sales. Why do we do events like this? The most obvious answer is “to make money” – money that can help fund extra events outside the budget. But there are other reasons. One of the most obvious is the sense of community that occurs as we work together. Around the chicken pickin’ table, folks check on each other and talk about topics that we often miss on Sunday mornings. An event like this is just one way that we build community. I would encourage you to look around this Saturday. Is there someone working that you don’t know very well? Take this time to learn more about them – hear their story and share your story. It is out of community that we can better serve the world around us, sharing the gospel with those we meet. You know, we can meet Jesus around the fire. We hear the word “faith” spoken a great deal around church. But, do you really know what it means? The dictionary offers two understandings. First, "faith is complete trust or confidence in someone or something." And second, "faith is a strong belief in God or in the doctrines of a religion, based on spiritual apprehension rather than proof." Let’s talk about this on Sunday. I look forward to seeing you then. We began our walk through The List this past Sunday, learning from the words of David found in Psalm 23. This week we continue with another favorite, containing perhaps the most well-known verse in scripture. Our passage for the week, selected by you, is John 3:1-21. What can you say about a passage that is so familiar? The first fifteen verses tell the story of Nicodemus’ clandestine visit to Jesus at night, where Jesus answers his questions - sometimes gently and sometimes sternly. We know this story well. And then we arrive at John 3:16. We can quote this verse from memory. Athletes, fans behind home plate, or in the end zone, hold this biblical reference up on colorful signs or paint it on their faces before a game. In a way, it has moved out from the church and into our collective culture. As I’ve been pondering on it this week, I saw something I had never noticed before. Reading our scripture passage from a Bible with red letters (signifying words that Jesus spoke), I was startled to notice that John 3:16 is black, not red. And then I did what so many of us do – I googled my question. Who said John 3:16? You won’t be surprised to hear that there are scholars who think these words came from Jesus, and those who hold to the belief that John was the one who said it. I hope you can join us on Sunday and we explore this question and others from this great chapter of God’s Word. It’s a new year! And, if you are like me, the years seem to roll around faster and faster! I am so glad to share this new year with you! First, you are invited to read one passage each day for 100 days. I would like to suggest that you begin on January 12. One hundred days will have you finishing the 100 days on Easter Sunday. A brochure will be provided for each person with the 100-Day Reading Plan, as well as a full explanation of the genesis of this idea. I hope you will use these verses as you listen for what God has for you each day. In addition, I will be preaching from the eight most requested passages beginning January 6-March 3, with one Sunday off as I travel with the youth for their annual youth retreat at Epworth. The passages you have selected are: Psalm 23:1-6; Matthew 5:1-16; John 3:1-21; Acts 2:1-47; Romans 8:1-39; 1 Corinthians 13:1-13; Hebrews 11:1-40; 1 John 4:7-21. This sermon series will end just before Ash Wednesday and the beginning of Lent. What a wonderful way to begin the new year – intentionally focusing on God’s Word. May it be a good year! Is there a calling, a word from God, that you have been waiting for all your life? I hope you will join us this Sunday as we explore the calling of the Light, the calling of that special star. May it get lodged in your right eye during this Advent season.